Going to another country can be exciting, adventurous, and maybe sometimes even a little scary. You have many things to look forward to and experience, as well as maybe a few concerns. We want to ensure that you have not only an amazing Cancun vacation, but also that you feel confident in your trip and in your stay here. 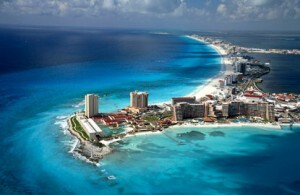 Let us answer the 3 most frequently asked questions about Cancun. Though millions of people come to visit Cancun and Mexico each year from all over the globe, some people still have concerns. Cancun is designed to cater to the many tourists that come to visit each year, and in order to ensure that tourists keep coming, the city makes sure it is a very safe place for everyone. Everything from the white sand beaches to the restaurants downtown are all safe for tourists and locals alike and are monitored 24 hours a day, 7 days a week. What it all boils down to is: yes, Cancun is safe. With over 240 sunny days a year, it’s safe to say the weather is great! The reason most people travel to Cancun is to bask in the warm weather and enjoy a vacation of pampering, while experiencing another culture. With high humidity, even the nights feel warm, but there is always with a cool breeze. With yearly average highs of 90 degrees and cool lows of 70 degrees, the weather can change somewhat quickly due to its tropical climate, and the hurricane season lasts from June to November. 3. What types of activities should we do? With so many different options available to you in Cancun, it can be very hard to decide how to spend your time here. Our suggestion is to have an idea of what kind of vacation you want to have: adventurous, relaxing, etc. With everything from adventure parks to 5-star spas and hotels, there is something for everyone. The best people to ask are going to be the concierge at your hotel or the staff at the reception desk. These people will have the best answers plus all of the information you could want as well. Do you have any other questions you would like answered? We would love to hear your feedback in the comments section below. Ready to book your Cancun vacation? Book it here!